While I was slightly miffed that we weren’t getting to see our beloved Jedi Master in the Rise of Skywalker trailer, I was thrilled we got to hear from him. I also loved Rey’s Anakin-style lightsaber; except for Mace Windu, the good guys in the saga films only ever had blue or green. I had hoped Rey would have a different color that would speak to the evolution of what the Jedi mean now, perhaps pointing towards Force users who embrace neither the light nor the dark. When Carrie Fisher came on screen, I couldn’t help but smile. This may be footage from The Force Awakens, but I know Director J.J. Abrams will do right by our Princess, especially in a film where she is part of the titular family. I have to admit I had been nervous in recent years that the sequel trilogy was forgetting that it was, well, the sequel trilogy. In my opinion, having “Skywalker” in the title tells me they are keeping the focus where it belongs in the final installment: centered on the family of the chosen one. The title also speaks to George Lucas’s penchant for “poetry,” with all three titles of the final installments in each trilogy starting with the letter “R.” While this may seem a weird thing to write about, I feel it’s very much something Mr.Lucas would do if he were still in charge. 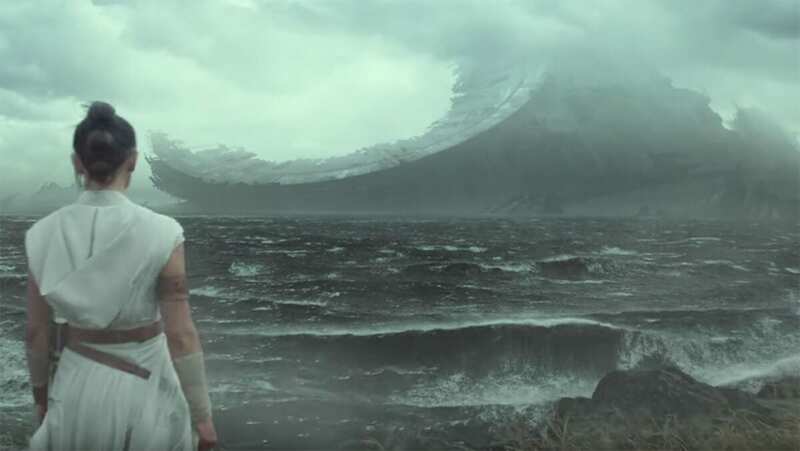 I wouldn’t be surprised if they consulted him on the title.Yet there was still one more surprise in the Rise of Skywalker trailer – the iconic laugh of Emperor Palpatine. The legendary villain’s return has been the subject of rumors since the film was announced, with many speculating Doctor Who’s Matt Smith was cast to play a younger version of the character (a casting he recently denied). I watched the trailer on the live stream, so the moment was made all the sweeter when the lights came back up and Ian McDiarmid stood on the stage. In Palpatine’s voice, our evil Emperor said to roll it again. You can bet Star Wars fans everywhere will be doing just that until the film opens on December 20th. Are you excited for the Skywalkers to rise or was The Last Jedi the last straw for you? Let us know in the comments and stay tuned for more Star Wars news on Geeks + Gamers!